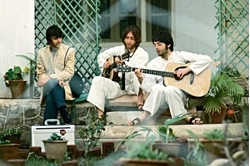 The Beatles magical mystery tour of India . Beatles Radio: The Beatles, Solos, Covers, Birthdays, News The Fab 4 and More! The narrow path leading to the main hall of the Maharishi Mahesh Yogi Ashram—or the Chaurasi Kutia Ashram as the locals refer to it—in Rishikesh is slippery even when not wet. What was once a paved thoroughfare, used by hundreds of disciples of the globe-trotting Indian ascetic, is today covered with moss that requires visitors to mind every step. Even as the impressive architecture of the buildings along the main walkway is hidden with foliage of plants splitting through the concrete, the giant hall inside, where the Maharishi gave his sermons, is a burst of colour. The hall is airy and spacious with a large platform at one end. Graffiti in all sizes adorn the walls, lending a colourful character to what fans have christened the “Beatles Cathedral”. While not much signage or information is provided at the ashram, the graffiti has been painted over the years by those who managed to sneak in with cans of spray paint and their love and loyalty for the British band from the small city of Liverpool who won over the world.